Some of the UK's top retail executives, including Marks and Spencer boss Stuart Rose, have been recognised in the Queen's New Year Honours list. Credited with reviving the fortunes of one of Britain's best-known retailers, he has been knighted. Fashion-to-homeware designer Jasper Conran is appointed OBE, along with Karen Millen, co-founder of the clothing chain that takes her name. Neal's Yard Remedies' founder Romy Fraser also becomes an OBE. British honours are awarded for exceptional achievement or service to an industry or sector. OBE stands for an Officer of the Order of the British Empire. Sir Stuart, 58, is knighted for his services to the retail industry and corporate social responsibility. He was drafted into Marks and Spencer (M&S) from the clothes store group Arcadia in 2004 and charged with restoring its health after a lengthy period of decline as shoppers deserted its outdated clothing lines for more stylish - and cheaper - designs offered by rivals. Sir Stuart helped fight off a bid from retail impresario Philip Green, pledging to return the M&S share price to 400 pence - the amount offered by Mr Green to buy the firm. The group's shares were then languishing at about 260p. Since then sales and profits have soared driven by a high-profile advertising campaign, starring celebrities including Twiggy. He has also revamped the company's designs, targeting the key female customer base and a giving a commitment to ethical and environmentally-friendly trade. 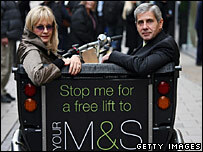 At the close of business in London, Marks and Spencer shares were at 554p, having exceeded 700p earlier in the year. Commenting on the knighthood, Sir Stuart said: "Naturally I am delighted, but it is as much for everyone at M&S as it is for me." Entrepreneurs in the fashion industry are in vogue in this year's list. Richard Bradbury, chief executive of the High Street casualwear chain River Island becomes a Commander of the British Empire (CBE), as does Maurice Bennett, who with his brother Michael founded the Oasis clothing store in 1991. Under Mr Bradbury's stewardship of the River Island retailing empire established and owned by the Lewis family, the firm has taken over sponsorship of British Graduate Fashion Week from Topshop and runs 250 stores in the UK, Europe and further abroad. Karen Millen stores are also prominent on the British High Street 24 years after the first shop opened in Kent. The brand is now owned by the Icelandic retail group Baugur, which also controls Oasis. Meanwhile, Romy Fraser is recognised for services to the health and beauty industry. Her OBE reflects her commitment to herbal and ethical skin and bodycare products, opening her first branch of Neal's Yard Remedies in Covent Garden in 1981.